Qualcomm Atheros AR5008X Wireless Network Adapter is a Network Adapters device. The developer of this driver was Qualcomm Atheros Communications Inc.. 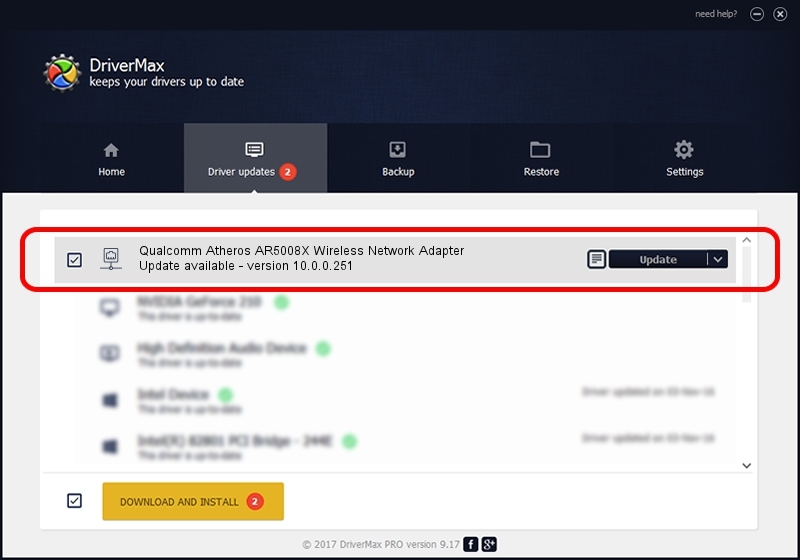 In order to make sure you are downloading the exact right driver the hardware id is PCI/VEN_168C&DEV_0024&SUBSYS_7125144F. 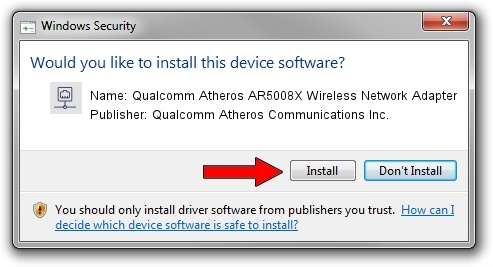 You can download from the link below the driver installer file for the Qualcomm Atheros Communications Inc. Qualcomm Atheros AR5008X Wireless Network Adapter driver. The archive contains version 10.0.0.251 dated 2013-05-16 of the driver. Run the driver installer file from a user account with administrative rights. If your User Access Control (UAC) is running please accept of the driver and run the setup with administrative rights. This driver was installed by many users and received an average rating of 3.5 stars out of 96166 votes. Take a look at the list of driver updates. Scroll the list down until you find the Qualcomm Atheros Communications Inc. Qualcomm Atheros AR5008X Wireless Network Adapter driver. Click on Update.